Do Bacteria Cause the Common Cold? Home > Bacteria in Everyday Life > Do Bacteria Cause the Common Cold? The simple answer is no, bacteria do not cause the common cold – the agents responsible for starting off colds are all types of virus. However, bacteria are involved in colds and are responsible for some of the symptoms we associate with the typical cold. The symptoms of the common cold are very familiar. A tickly sore throat that keeps you awake at night, a tickly nose that then starts running uncontrollably, a heavy feeling in the head and chest, tiredness and lethargy, feeling hot and then cold. The severity of the symptoms depends on which virus is responsible for the initial infection of the upper respiratory system. Some colds are very mild and are described as self-limiting infections. They don’t need active treatment and they aren’t life threatening. Simple self-care with hot drinks, more rest and a mild painkiller and the symptoms pass off quickly within a day or two. The trouble with colds, however, is that they can be only the start. Once the respiratory system is affected, this opens the body up to further infections. Some viruses that damage the delicate lung tissue can be the prelude to longer-lasting coughs and bacterial infections. There isn’t just one virus that causes the common cold, there are many. One of the most common types of virus that infects the cells lining the upper airways in people is the Rhinovirus group. These probably cause about 35 per cent of all colds. Coronaviruses are another major group of viruses that can cause colds, with four strains known to be active in people. Other colds are caused by adenoviruses and coxsackieviruses. Many people describe colds, particularly bad colds, as ‘flu. Influenza is a far more serious viral infection, however, and it can be fatal. An influenza epidemic just after World War I, that struck all over the world between 1918 and 1919 is estimated to have killed 100 million people, many of them in the prime of life. It was a ferocious virus that caused bleeding in the lungs. Influenza viruses belong to the orthomyxoviruses group and influenza-like illness that is not quite as serious can be caused by paramyxoviruses. Although the initial infection that causes a cold is due to a virus, the symptoms that can be attributed to virus infection only last 1-2 days. Colds can last a week or two and this is because the damaged cells in the airways become susceptible to a secondary infection by bacteria already present there. Normally, these resident bacteria don’t cause any harm but when the cells are killed and the tissue is inflamed, they seize the opportunity to become pathogenic. 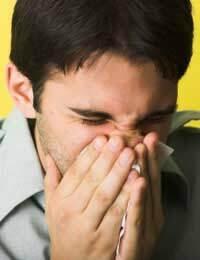 Only the very surface layer of cells are affected – but the response by the body produces the mucus that causes the misery of a blocked nose and a constant cough. Mucus production continues until the body becomes immune to the virus and the cells in the airways regenerate a tougher outer layer that is no longer open to bacterial attack. Even with the secondary bacterial infection, the common cold still lasts only a few days. However, in the very young or the very old, the secondary bacterial infection can be more serious and can infect cells deep in the lungs, causing a chest infection or even pneumonia. The symptoms of a chest infection include coughing up mucus that is green rather than white or clear and having a raised body temperature. As the cause of the common cold is viral, colds cannot be treated using antibiotics, as these have no effect on the viral stage. Antibiotics taken for other reasons while you have a cold will probably reduce length of a cold, because the secondary bacterial infection will be cut short. However, experts advise against using antibiotics to treat any part of a cold. Colds are not serious enough, and over-use of antibiotics leads to the spread of antibiotic resistance in bacteria of all types, not just those that cause secondary infections in colds. The exception is for people who develop a serious lung infection as a result of a cold – a chest infection can be life threatening and older people and babies are frequently treated with antibiotics for this complication.